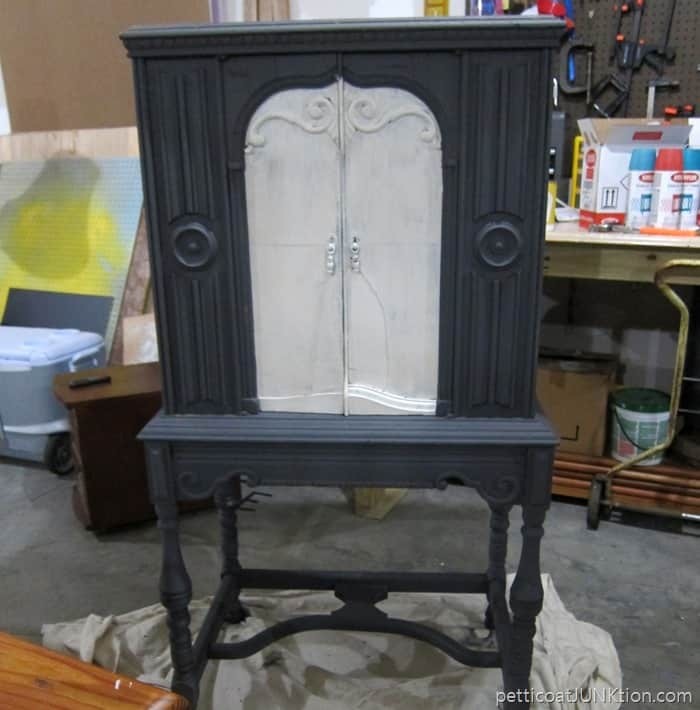 The gray paint finish for the vintage radio cabinet didn’t go as planned. I had to tweak things as I went along. Par for the course. Today I’m sharing the nitty gritty details.….lots of photos ahead. 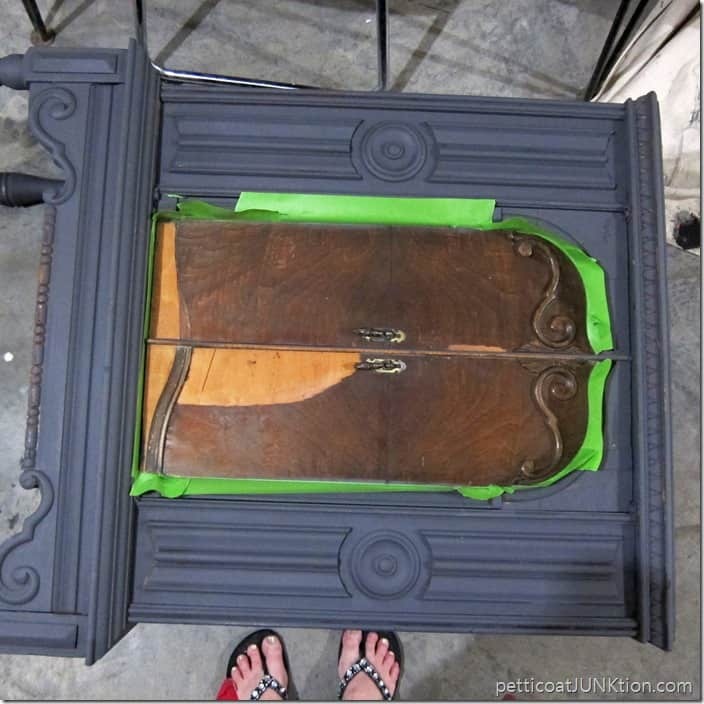 Today I’m sharing the nitty gritty details of painting the vintage radio cabinet. Word of warning….lots of photos ahead. 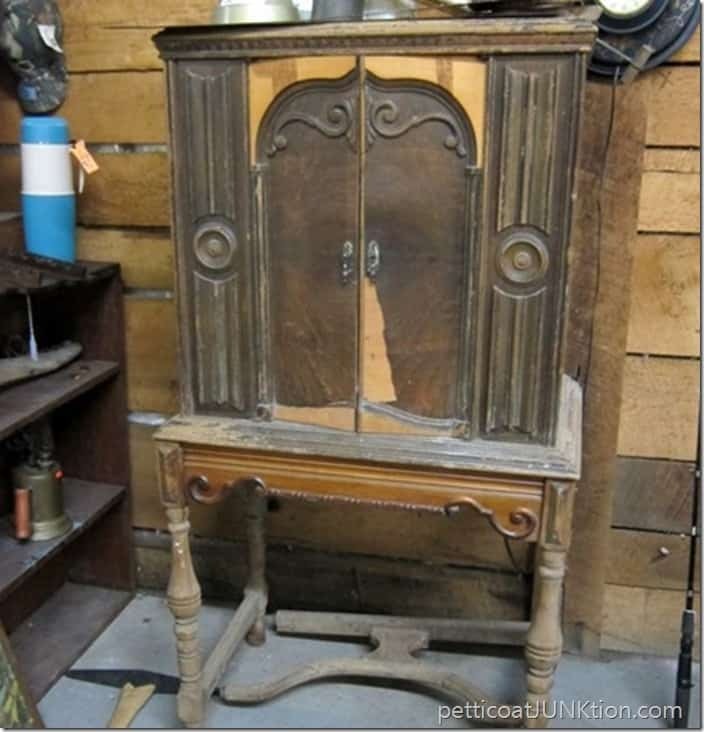 By now you are all familiar with the radio cabinet. If you’re new here you can see how the JTS removed the radio and added shelves by clicking the two pink links. I worked with all the missing and loose veneer. Instead of stripping it off I glued the loose pieces and didn’t worry about the missing pieces. The areas with chipped veneer will look great when distressed. The top was a mess too. No veneer and gouges in the wood. 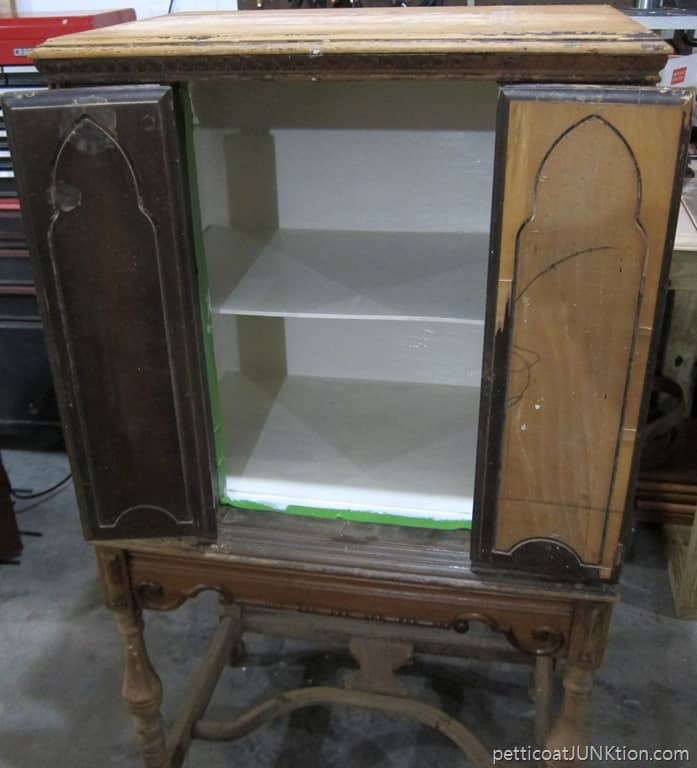 The JTS filled the worst parts with wood filler.The cabinet was finally ready to paint. You can see the details on painting the inside of the cabinet here. I used Off-White Beyond Paint. I didn’t notice the loose and gaping veneer pieces until I was painting the inside of the cabinet. 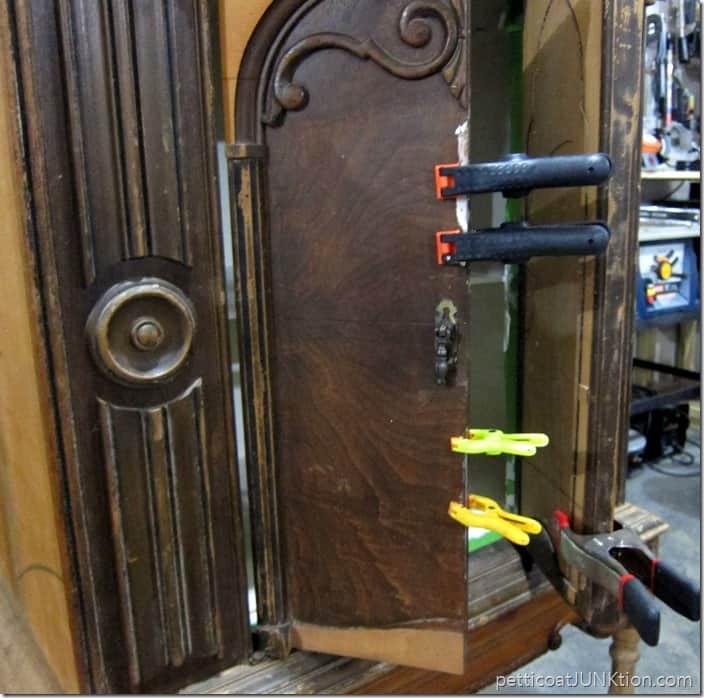 I used wood glue and clamps to take care of the worst areas. Before painting the outside of the cabinet I used FrogTape to protect the white paint inside. Didn’t want gray on the white. 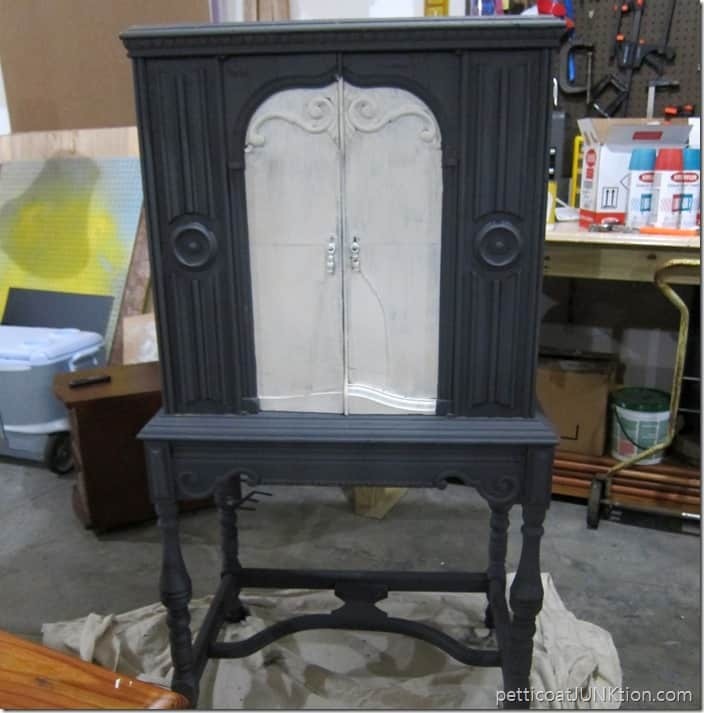 My first plan was to paint the doors white and the rest of the piece gray. With this plan in mind I used FrogTape around the doors too. Done with the doors. Painted with off-white Beyond Paint like the inside. Now I’m ready to dry-brush off-white paint onto the gray. 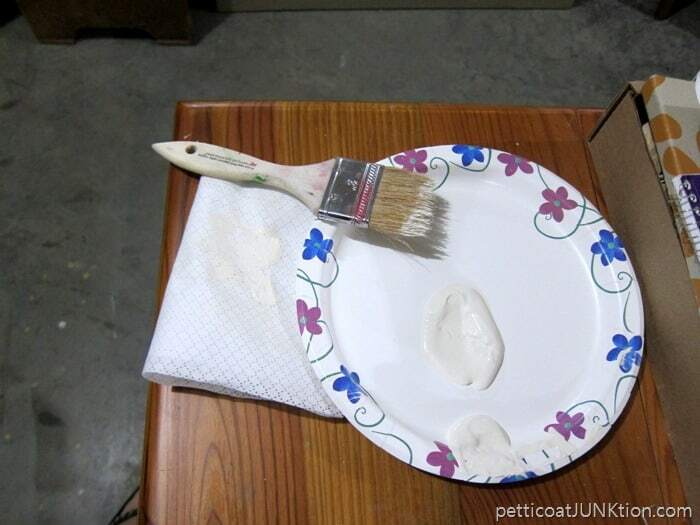 All it takes is a dab of paint for dry brushing. 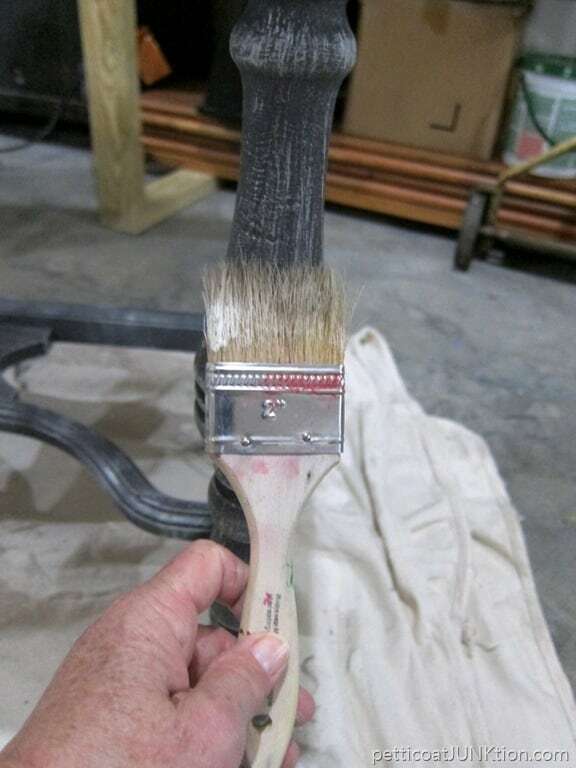 Dip the brush bristles in the paint then wipe most of the paint off with a paper towel. Run the brush over the raised details. 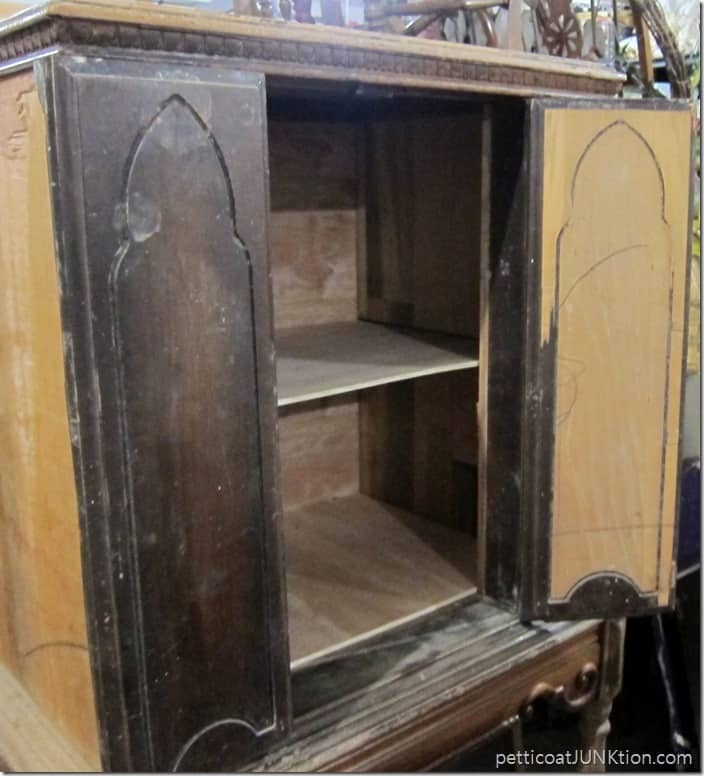 Then I distressed the whole cabinet by hand. 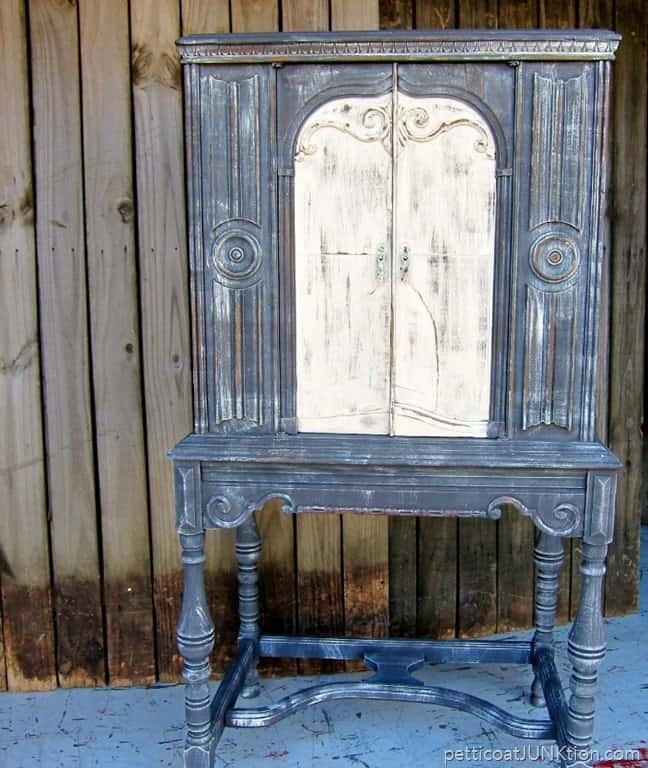 This is what it looked like after the distressing. The color is bad because of the different camera I was using. I kept looking at the piece and was having doubts about the look. I showed the above photo to Sara at the shop and she said the white looked like a tombstone. That did it for me. I can tell you the paint process after that, I just don’t have photos. When I’m working on a project and using trial and error (a few fits too), I forget to take photos. 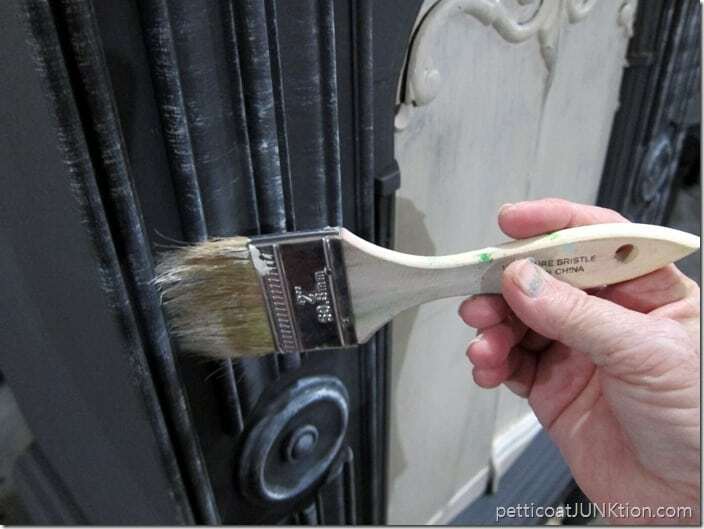 I painted gray over the white then painted gray over some of the dry brushed white areas because there was too much white. Then I distressed the whole thing again. When I was trying to decide on the paper for the interior I noticed how the white paint on the front edges of the shelves popped out at me. So I painted them gray too. 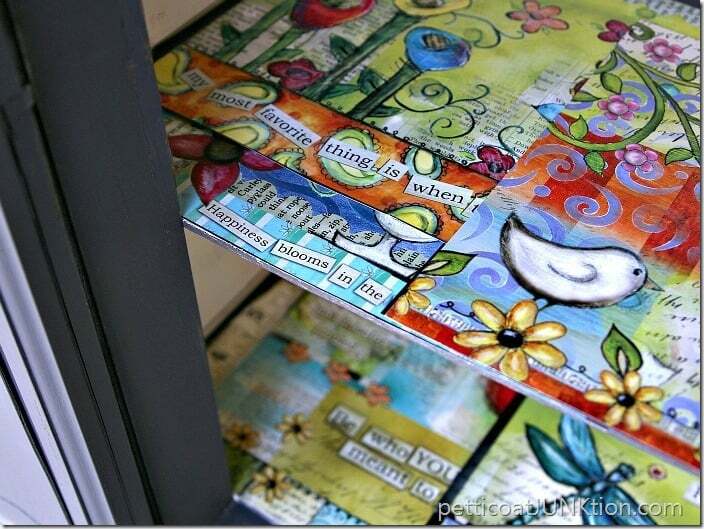 If you missed the post about the Calendar as shelf paper you can see it here. And that was the process Ladies and Gentlemen. Sometimes my first plan, second plan, and sometimes third plans don’t work. Have you ever worked a project over two or three times before you got it right? 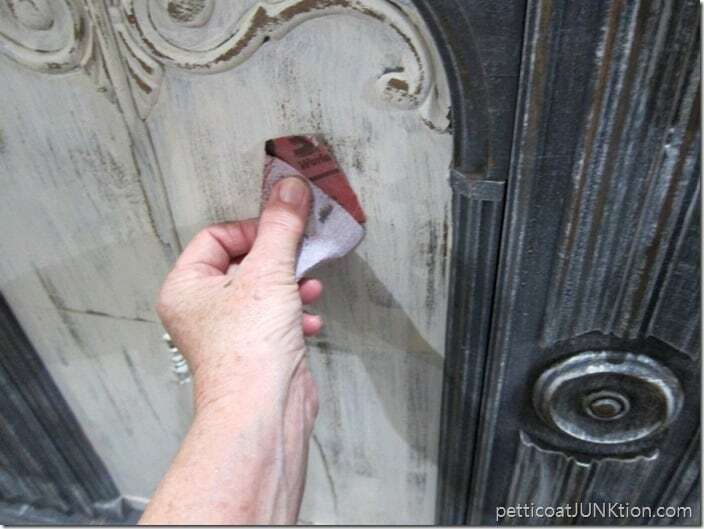 I think you will enjoy my video on How To Antique Painted Furniture…. 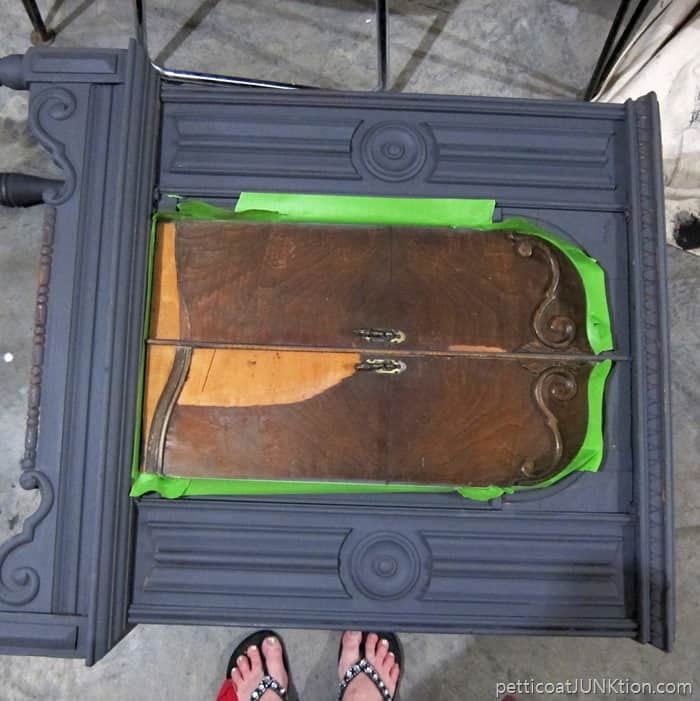 That is a WOW piece of furniture! Thanks for sharing how it was done. Wow! That looks fantastic! You are the queen. Love it! Hi Kathy, so glad I stumbled on this on BlogTalk. 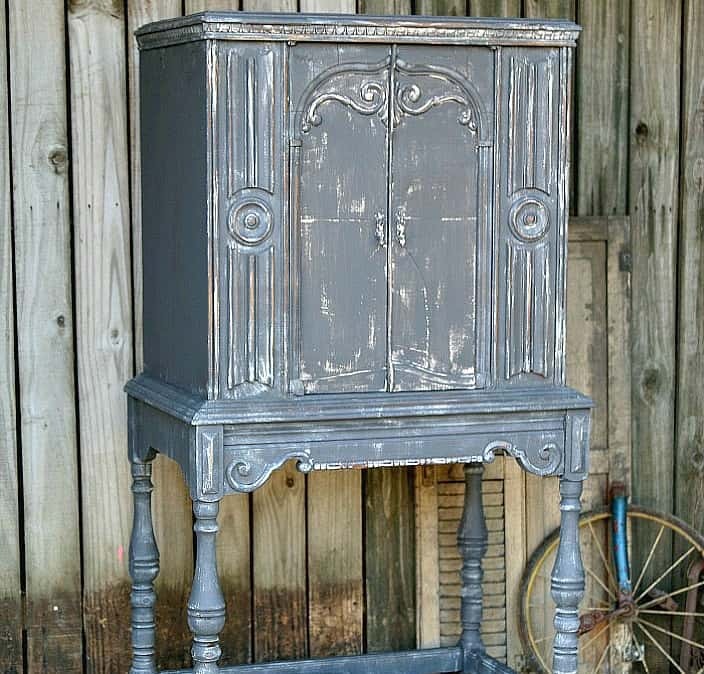 Just found a little piece this weekend and considering doing something gray-ish. Pinning this for future reference. thanks for all the detail you provided. Will certainly come in handy. 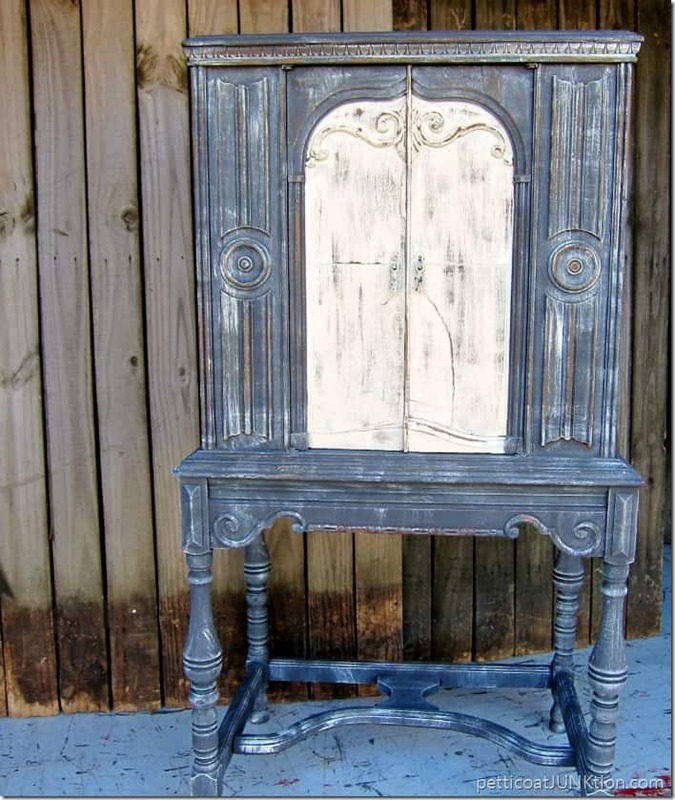 Like the gray doors and the distressed look overall. Holy smokes, what a lot of work. What patience you have. I would have thrown the piece on the woodpile!!!! Nice salvage. I think I would have gotten rid of a little bit more white. 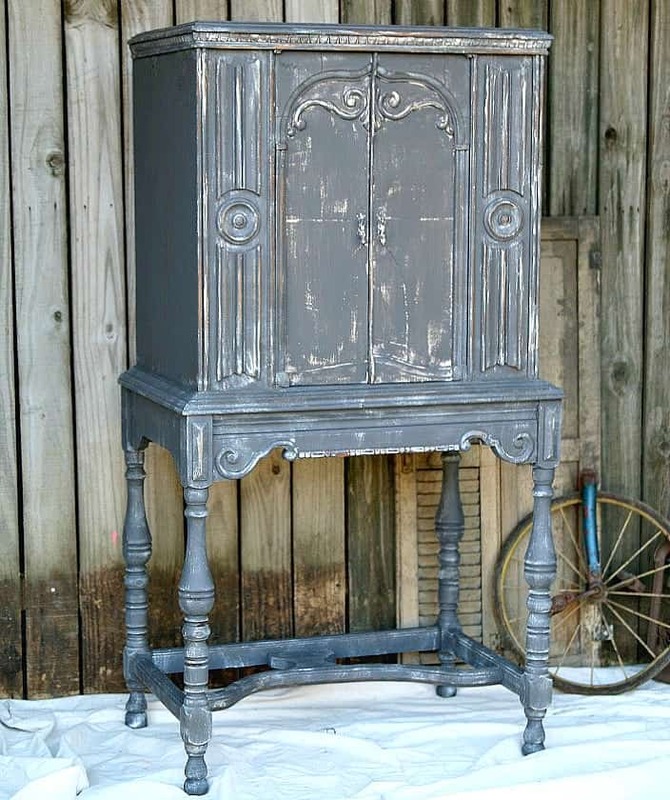 And yes, I’ve repainted many pieces until I get the look I want. Beautiful! I absolutely love everything you do. Can’t wait to see what you are up to next. You really inspire me! I liked the white doors. Black pulls would look nice, too. Being a fan of this piece, I feel I can be honest. I want to somehow pull out some of the details in a more noticeable way. Looks great. Definitely worth the extra effort.